It is time again for another Five for Friday with Kacey from Doodle Bugs Teaching! It has been an interesting week with only two partial days of school! I am loving the extra sleep! 1. I spent my Thursday afternoon tutoring the kindergarten student I work with. He has needed a lot of help with learning the letters of the alphabet. We started our tutoring session by using some of the activities from the I Can Read the Alphabet packet from the Educents Preschool Rocks Bundle. I used the alphabet cards from the pack to help with letter identification and order. I taped the words around the room for him to find. He used his alphabet tracking page to help him find the letters. As he found them, we put them on the table. Here are some of the letters and him as he was looking for the letters. He had so much fun with it! After we finished finding the letters we worked on letter sounds and completed this simple matching sheet that went with it. 2. Each session he reads a new book and works on tracking print. Yesterday he read the book from the I Can Read the Alphabet packet. He did a wonderful job tracking the print as he went through the book. 3. He has the most problem with rhyming, and we used a cut and paste page from the Rhyming Unit Mega Bundle to work on rhyming. He did a marvelous job with it! I love when I see such progress in a student! 4. On Sunday I broke my cherished Deep Covered Baker from Pampered Chef when I dropped the lid on the floor. Ugh! I am having an online catalog show, and you can help me get a new one by browsing the catalog and placing an order! And if you order through this link, I will send you any item of your choice from my TPT store! 5. 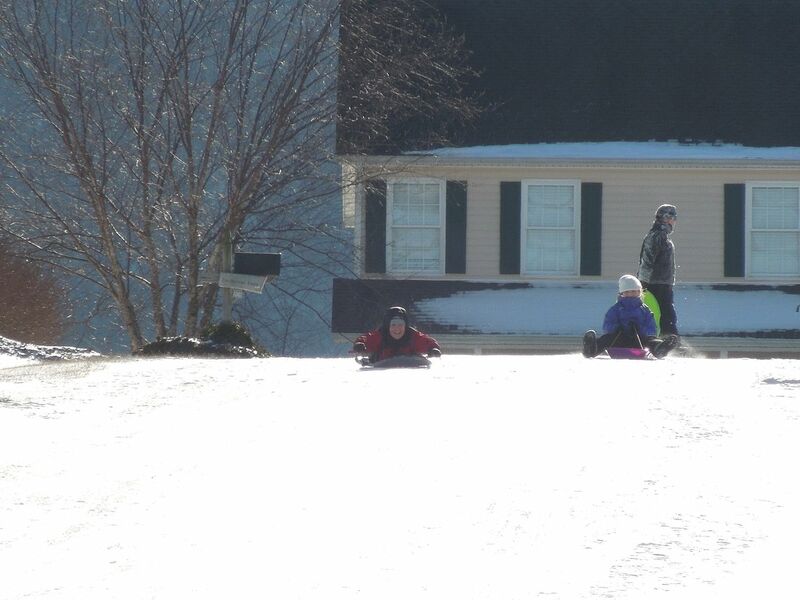 And I leave you with these pictures of my kids sledding down the hill. What were you up to this week? Link up with Kacey at Doodle Bugs Teaching to let us all know! Even though you broke your lid, I am glad you are having a fun Winter. 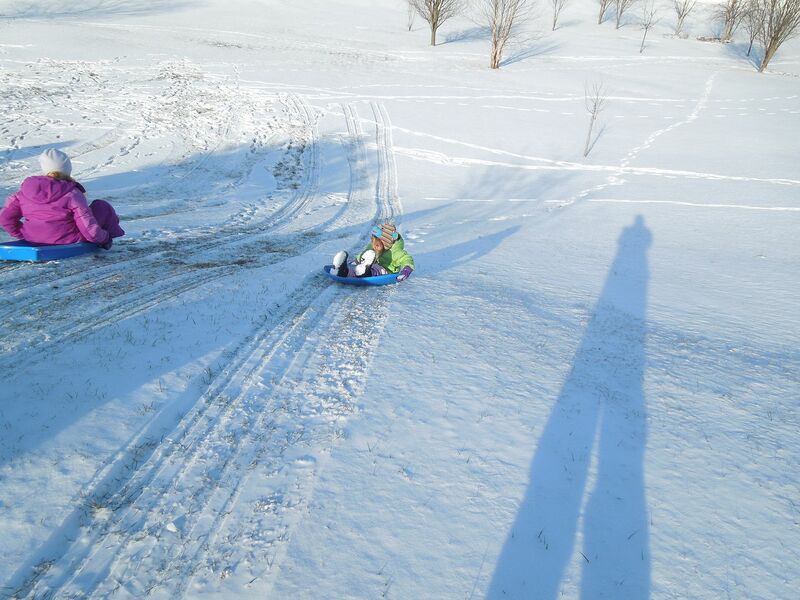 Those sledding memories seem to keep forever. Good luck with your student you are tutoring, that can be so rewarding. Why almost no school this week? The snow? I am impressed with how you stay on top of things and always are posting! We had the threat of snow and then some actual snow and icy roads. Then it was so cold that they didn't want kids to wait outside in the cold temps. And the buses struggled to start at 6:30 in the morning. I enjoyed the time off! I work a lot to have good posts and schedule them in advance. It helps a lot to keep me on my toes. Looks like your kids really had fun in the snow! I was the big baby in the family that wanted to get out of the cold. I think Keagan and Steven could have stayed out there forever! I'm tutoring several of my little ones who are still having trouble with alphabet identification and sounds. Loved your ideas. Thanks for sharing! That snow looks lovely! I would love a good snow day, but unfortunately we don't see many of those in Mississippi! Looks like you are spending your time well, though. :) Thanks for sharing! I grew up in Louisiana, so I embrace the snow now! My friends from Michigan and Minnesota always laugh at me because I love to play in it. I guess they don't realize that I never got to enjoy that part of childhood that they did! Enjoy snow in Mississippi when you do get it! I know we have all heard this 1,000 times but since I live in New England, it is so different with the winter weather. 5 degrees out? Kids bundle up big time and as long as there is power and water we go to school. Of course we also have all the stuff we need to treat the roads too for snow and ice that you guys do not have. It's so different! I honestly though would rather be with you down there. I hate winter ! I actually love winter and long for a BIG snow like we used to have all the time. We have quite a bit of equipment to get the main roads, but I live and work in LARGE rural counties where they can't get to the roads. My babysitter's road is a dirt road straight up a mountain with room for really only one car. Many roads are like that here. And one part of the counties may get a lot of snow and others will get nothing. They have to close the whole county and not just one or two schools because of the feeder middle and high schools. Crazy but that is how it works. I always dreamed of kids going outside for recess in the snow, but our teachers won't go out unless it is at least 40 degrees outside. And our kids don't come to school in snowsuits and such. Maybe one day!